I am struggling to understand the backward-forward flow in this system and how it drives the pistons. I look forward to more detailed calculations and sketches that demonstrate the flow and piston action. You are welcome to support my proposal. Great progress over the last couple of days! The addition of a GIF image helped a lot! My main concern in all the estimations is lack of considerations for efficiency of conversion steps and system losses. - for the wastewater treatment plant you consider 100% of rainfall transferred to the city's treatment plant, neglecting water soaking into the ground, absorbed by plants, evaporation, etc. A different concern would be the stability and vibration of the shutter under considerable mechanical stress. Still, it is one of the freshest approaches to hydro power I have seen in a while! Good job! Michal's comment is very clear and helpful. I would also expect losses due to the shutter system itself, and I am concerned about the durability of the system--that's a lot of power for so many moving parts to try and harness without sustaining damage. i was surprised at your offer for 50% royalties on Canadian license as anything above 5% requires Government approval. Perhaps you meant 5%? you referred to wrong type, because wind i.e. air is compressible, but water is NOT compressible, thus wind efficiency subject to Betz' limit 60%, but the ideal efficiency limit for non-compressible fluid is up to 100%, though friction will always compromise it. If the load is too heavy, it could stop the "virtual lock", i.e the closed 2 shutters, but the accumulated water head will by-pass over the top of shutter, or run through the opposite open 2 shutters in a N-shape path. Anyway, limiting the electric load to the rated power is a good practice, but no big issue even overload temporarily. Experiments show some turbulence is inevitable, but efficiency reduction is not significant. I also experimented wind-driven shutter turbine, the turbulence is so small to observe. Although this design also feasible for harnessing wind power, but I confront difficulty to cope with the wind direction change, unless whole system sits on a wind-tracking yaw base, but that is troublesome. 1. Closing shutter only needs tiny energy. In fact, the triggering energy should be at least capable of turning shutter 5 angle-degree, so as to set it in a non-equilibrium transient, then the flowing water quickly does the rest to fully close it, just like a wind yawing mechanism consuming tiny wind energy. 2. Yes, rain evaporation on city area does exist, but the major 95% above will sink to sewer system, unless the rainfall is too small, so as to just wet the road or ground without fluidity. This problem can be avoided by my undocumented engineering design for sake of IP protection, though copycats can find their own way with some difficulty. Betz' limit 60% can only apply to rotary turbine in wind, not include planar reciprocal turbine, such as shutter turbine that can greatly break the 60% limit. My shutter turbine can also be used in wind power application, but it should sit on a platform with complicated yawing system, that is why I am not actively promoting it. When used in wind app, shutter material can be the same with regular sail-driven boat, dirty cheap sailcloth. Yes, you're right - water should not be treated as a compressible fluid. My choice of comparison with Betz's limits was unfortunate and it's related to my educated, yet unsupported by calculations, guess that the actual efficiency you can get from your design is in the range of 60-80%. the ideal theoretical limit for this design is 100%, attention: I mean IDEAL, not real. 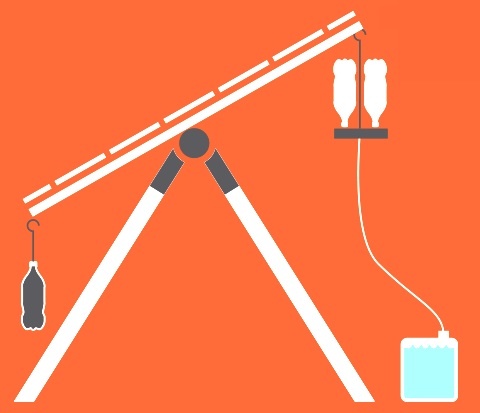 The water can be deemed as rigid body because of its non-compressibilty, just imagine when you lift a solid concrete, the concrete will gain potential energy m*g*h, then what is the efficiency of your hand? of course 100%. But in fact, in my design, there is 2 virtual water channels and gap: left half, and right half of full water way. Because these 2 virtual channels are not isolated by a middle board, so there is small leakage in-between while in working, but as long as the gap is close to zero or insert a middle wall with space-limited slits that allow free motion of linkage bars, then the water leaking can be controlled to minima, then efficiency can be close to ideal efficiency. All those improvements are just a matter of engineering. No surprise, I am generous enough, if I got $1 from royalty fee in Canada, I will send you $0.5, and you can collect it for lifetime. Hurry up, if you interested, only 4 days left. The machine gun is shooting toward the 3-blade turbine, but the gun is triggered only at a series of special designed moments, so that all bullets can pass through the blade gaps of turbine. Therefore, no matter how powerful the bullets stream, the bullet's kinetic energy can never be harvested by this silly turbine. Our shutter planar turbine does intercept all water's kinetic energy in the stroke of work, and release all water with full opened shutters while in the stroke of retraction. Therefore, the efficiency can be maximized in very close to 100% in a duplex configuration of shutters. Of course, a real axial rotary turbine will never be so unlucky as in above animation, water flow can substantially turn blades of a turbine, but efficiency is certainly lower than my planar turbine, because of too much gap space between blades. I don't have enough money to apply patents in those countries with small market prospect, therefore, if anyone or entity in those countries wish take advantage of exclusive rights for your max profit, you can pay me small lump-sum buyout fee (negotiable, for example, a very tiny country may only charge as low as $5K) for locally registering patent with your name as owner and me as inventor, otherwise if nobody acts, then free to use for everyone without privilege of monopoly & royalty in those small-market countries. I can help you set the priority date for your local application. Act as soon as possible, if anyone has the great ambition in those countries, otherwise good opportunity will vanish! 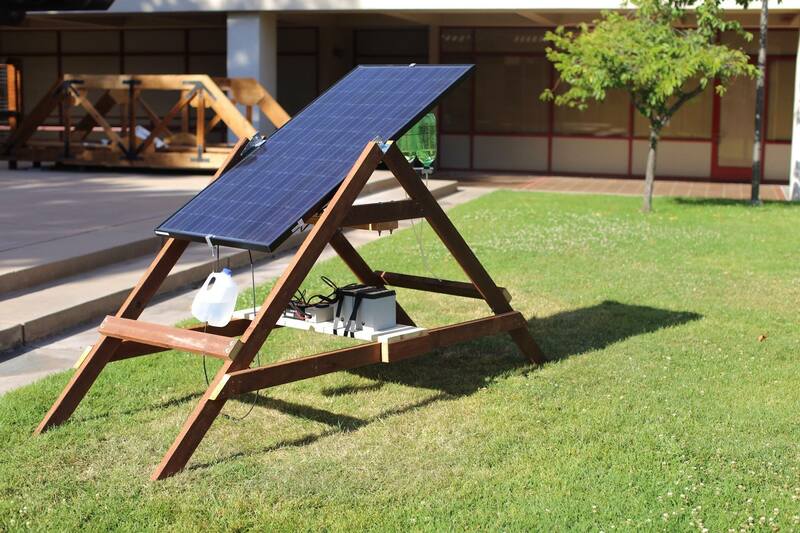 Suggest Rick Perry of DOE study this innovation for sake of greening US energy supply. All conventional commercial turbines are type of rotary, they either bend straight water flow into a loop then dump out, or turn 90° or other angle, e.g. 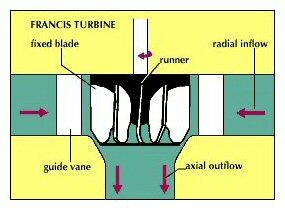 the typical axial turbine: inflow horizontal, outflow vertical. Above figure shows the water flow have been bent twice 90°, even right side with back pressure to turbine, because of water lever higher than outlet. There is big braking energy loss when bending fast water flow because of centrifugal force. Anyway, for low speed water flow < 5m/s, bending water is not a problem, but for super fast flow e.g. 100km/s, i.e. 28m/s, claimed in other proposal by other expert for harnessing Canada Fundy bay tide energy, rotary turbine will face great challenge! Just image the situation for a 100km/s running car turning 90° with small radius. My shutter planar turbine never changes direction of flow, this is a great advantage ! Below array of rotary turbines can be easily replaced by one single cheap shutter planar turbine! A slice of shutter vane is lightweight, and super long vane can be assembled in situ, by splicing short vanes (max transportation length 50' or 15m), therefore, it is convenient & low cost for the transportation from manufacturer to installation site. 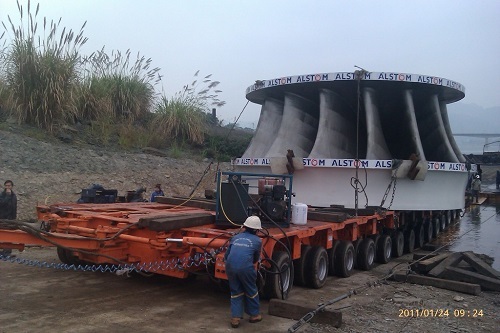 But for conventional huge oversize rotary turbine, transportation is a costy headache! Above expensive transportation even can cost a small 10kW shutter-turbine project. 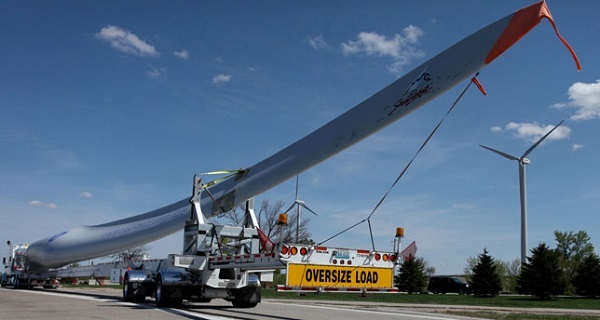 transport wind turbine more expensive, even have to modify road! In fact, wind power industry can also use my shutter turbine technology, provided there is a good yawing mechanism. User will see many folds increase of efficiency, even break Betz's limit 60%! Although I worded the title with phrases "shallow" and "low head", in fact, it can be omni-used in any situation, even can replace regular high water head dam-served turbine! It is just a matter of shutter slice vane design selection for different applications, for low head, thin vanes, and jet pump trigger on shutter open/close; for high head, thick vanes, and hydraulic actuator trigger. It seems that most turbine designers worship the historical figure: Viktor Schauberger, an Austrian engineer who mystified the vortex turbine with supernatural spirit. Your shutter turbine, let water straight in, then straight out, no vortex, no spin, then no spirit. How can your turbine contest with the God blessed traditional rotary turbine, eh? I only respect science, not any specific historical famous figure. Do you know that your mentioned Viktor Schauberger is labelled as pseudoscientist by Wikipedia? If I can high-efficiently harness hydropower without need of bending water flow, why must I have to spin water? Who wrote the entry in wikipedia? It is profane to the god of turbines. Improvement of humankind well-beings calls for more innovative renegades to take actions! 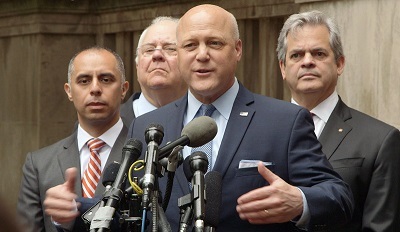 U.S. mayors plan funding for distributed energy, smart grids and more. The nation’s mayors are pushing for policies that will preserve existing federal programs and expand support for grid modernization and clean energy. My shutter turbine for hydroelectricity is the best solution of the mayors demanded distributed generations! 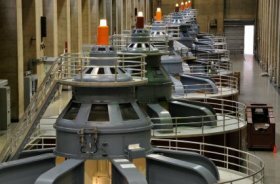 For a long long river, such as Mississippi, every riverside community can install a dam-less shutter turbine for harvesting hydropower to form a local micro-grid, no matter how close two neighboring communities, even as close as 100 meters. Such a pattern of one by one isolated but integrateable micro-grids is just the essence of distributed energy backbone. The local solar PV & wind-power can also join in the variant-sourced local micro-grid for balancing peak and valley load. 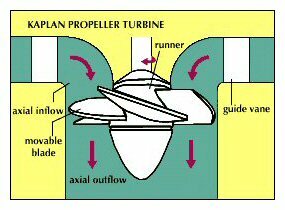 I heard Francis turbine and Kaplan turbine can both reach 90% efficiency. Your shutter turbine efficiency may as higher as 95%, but the difference with the prior 2 types is not significant, so you need other strong features to allure new users. You showed 2 good competitors. Although their efficiency are inferior to my shutter turbine by only small deference 5%-8%, however they all need a dam to establish some height water head, and it requires to shrink natural wide waterway vertical cross section to smaller penstock size, therefore, the power areal density of turbine is very high, so as manufacturer can make turbine compact for transportation. In a sense, the inlet of turbine is throttled. 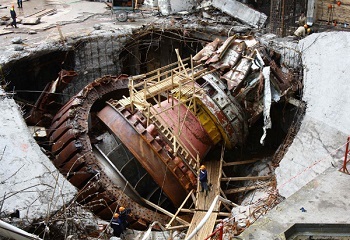 The dam alone is a big costy project, not to mention the expensive turbine. Shutter turbine does not need to change natural waterway, therefore needless to construct a dam, it simply harvests the low areal density power of natural water flow via pushed shutter surface. Dam-less will save lots of initial capital, also a turbine with low areal density power is always cheap to fabricate, or easy assembly in situ. As shutter surface area need not to full cover the vertical cross section of natural waterway, e.g. less than 80%, so large fishes, even cowfishes will not affected by turbine, as well as small fishes can simply pass through opened shutters. It is also easy to cope with flooding occasions. All above features will eclipse you mentioned 2 typical turbines, and make shutter turbine outstanding as users best choice. The theoretical efficiency limit of Francis or Kaplan turbine, is about 90% at a given optimal water head, though practical efficiency probably 70% - 80%, then where the 10% more energy loss goes to? The answer is: because it bend water flow in a loop or partial loop, thus energy is wasted in centrifugal braking and water angular energy , that is why the temperature at outflow of turbine is little bit more than inflow. In shutter turbine system, almost only the shutter-toggling actuators or jet-pump will consume auxiliary energy, that may takes away at max 1% (for large capacity) to 5% (for small capacity) from marketable output. That means the max efficiency of shutter turbine is 95% to 99%, and the larger the turbine, the higher the efficiency. A1*V1 = A2*V2, or V2= (A1/A2)*V1. Generally, for a dam-backed hydro station, A1/A2 is quite large, e.g. > 10, that is why the commercial turbines in market are made very high power areal density, at least 0.2 MW/m^2. more omitted to mention with drainage to Atlantic ocean, Pacific ocean, Arctic ocean. 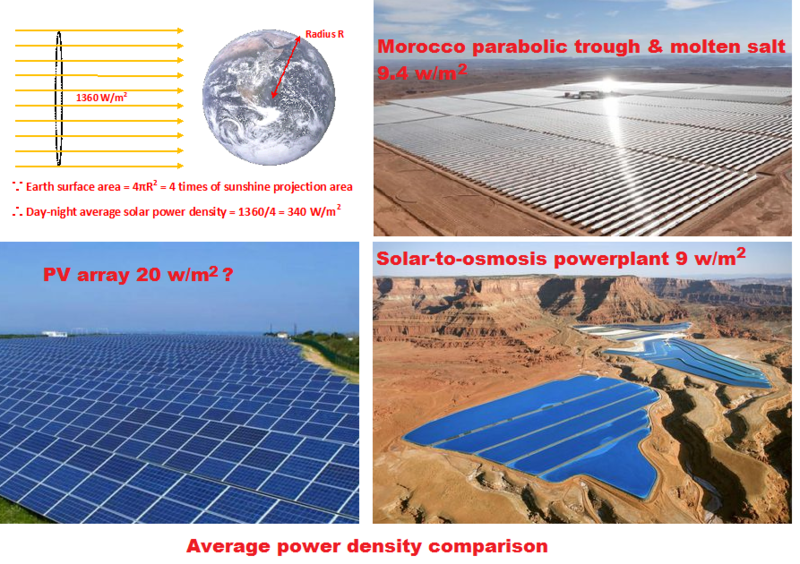 7. if W > 5 * power-areal-density-of-solar-panel = 500 W/m^2, i.e. V > 1m/s, then very worthy to develop hydroelectricity! In fact, at V = 0.58 m/s, the power areal density will be equivalent to solar PV, and because the cost of per shutter square meter is far less than PV's, thus such river is still worthy for hydroelectricity, though not too much lucrative. 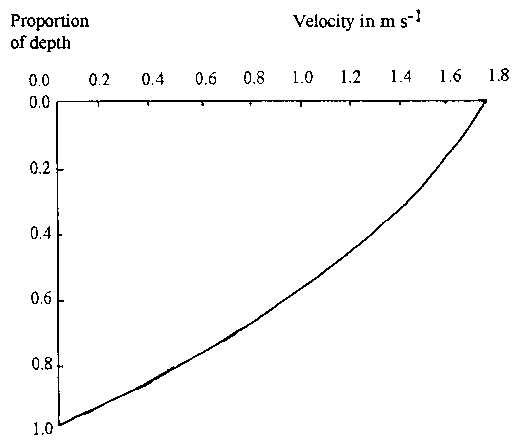 By narrowing waterway, the velocity can be increased. For example, there is a river, V = 0.5m/s, and river width 20 meters. If narrowing river to 10 meter width, i.e. 50% shrinkage, then V will be doubled to 1 m/s. Therefore, even the water flow speed is not good enough (<0.5m/s), but if municipality permit, by doing a waterway shrinking / bottlenecking small project, you can still develop a profitable hydroelectricity project! Narrowing waterway project is far easy and cheap than constructing dam project which aggressively & greedily controls upstream flow through axial turbine embedded penstock. Dam can impose ecological negative impact, but river strait does not. Shutter turbine can benefit from waterway narrowing, because of power areal density raise, though still lower than the compact conventional rotary turbine. Therefore, the surface water always has higher kinetic energy then riverbed. For best performance-cost ratio, the shutter turbine is not supposed to cover too many lower portion of river cross section, because of low speed flow disadvantage thereof. All marginals of shutter turbine are good pass way of fishes. For a small populated riparian community, if the river potential hydro too powerful, then as a good practice of economic self-sufficiency of distributed energy, the shutter turbine installation should only occupy reasonable small percentage of river cross section area, so as to remain more space for marine species and villagers leisure. In general, a residential of 4 occupants (parents + 2 kids) monthly hydro bill 1000 kiwaho (a new coined English word for Kilowatt-hour Kwh), then average power per capita = 1000/(30*24)/4 = 0.345 kw = 345 watts. For 1000 population, max demanded power = 345 kw, thus demanded shutter area = 345/4 = 86 m^2. The coverage ratio of shutter-to-river-cross-section = 345/1000 = 34%. That means most waterway (66%) is free, and the nearby village power supply self-sufficient by a less shutter turbine coverage. 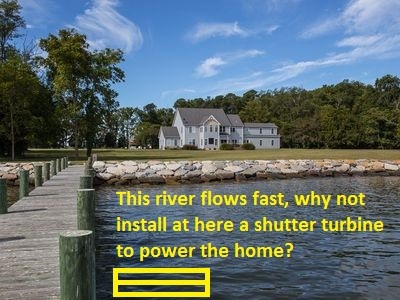 For those low population density rural area, a waterfront farm house or cottage can install family-package shutter turbine for energy autonomy. Such basic application only needs about 1 square meter shutter area, as power areal density circa 4000 W/m^2 for flow speed 2 m/s, the rated power is enough for single family full time 7x24 usage. This tiny usage of river cross section is easy & cheap to install for complete off-grid, it is the pristine instance of decentralized distributed localized backdoor pier energy supply! Therefore, there is huge virgin market for this single-family energy package. any of various machines having a rotor, usually with vanes or blades,driven by the pressure, momentum, or reactive thrust of a moving fluid, as steam, water, hot gases, or air, either occurring in the form of free jets or as a fluid passing through and entirely filling a housing around the rotor. Obviously there is no rotor in your mechanism, only reciprocal motion, so strictly speaking, it is fake turbine, but still excellent breakthrough invention, I love it! It seems that rotary motion is more noble than the humble reciprocal motion, that is why the greatest invention is often described as revolutionary which etymology is related to rotary. It is not proper to rule mechanics by caste system. The higher the efficiency, the better the performance. I have read author's all 6 proposals, and feel very deep and recondite in technologies, even with some new discoveries that may be probably true, but scientific community currently is not ready to recognize. I am sorry to see this excellent proposal is out of judges' selection. You obviously over-estimate the judge's calibre of intelligence, perhaps you did not read the biography of their backgrounds. the judges' comments for this subject proposal: "... Here, a new technology is presented but there is no comparison with existing technologies in terms of costs, impacts, efficiency, etc. ..."
Every regular reader with normal discretion can see you did the comparison with lots of texts and figures. 4. never disclose high value invention in here, you disclosed too much about your cutting-edge technologies, presenting some fancy "toys" enough. You are really a great genius! I well studied your descriptions, and successfully prototyped a demo system. Its efficiency is so awesome, also reliable! I successfully prototype it this week, runs beautifully and melodically. But it seems difficult to reach 90% efficiency, maybe my mini jet pump consumed too much energy? Please offer me some advice to improve it. This contest finished. Still so many enthusiasts on this project? surprising! Anyway, thank all your guys support. I have no interest in benchmarking the judges' intelligence or IQ. I understand all sophisticated inventions not easy to get quick recognized, especially challenging the systematically formatted scientific community. Indeed, your mentioned reality has educated us that: here is not an ideal platform to present the greatest innovations. congratulations to your successful prototype. As to the efficiency, you should first take care of the reciprocal run length. It should be larger than the axial dimension of a regular rotary turbine. For higher efficiency, you need reasonable lengthy run. also try to used small jet pump for toggling the shutters. For more detail discuss, we can choose other channel, such as special forum or direct email. thanks to all your enthusiasts! 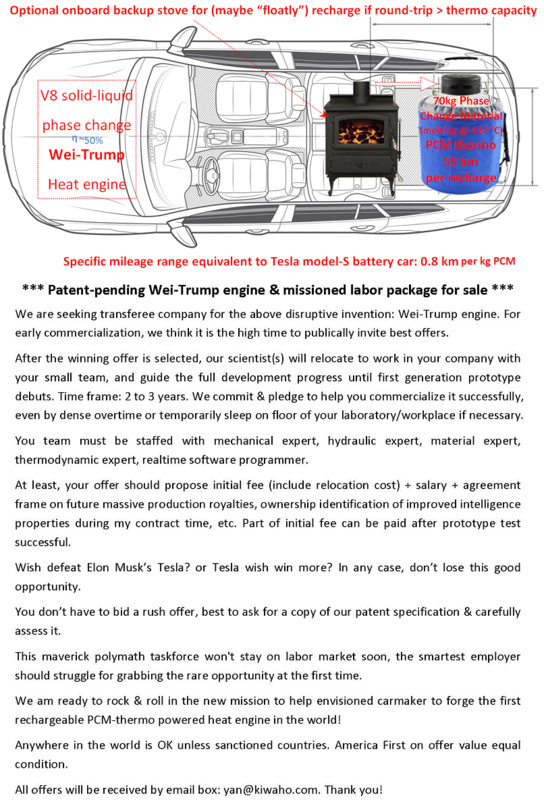 Unfortunately, Mr. Tesla did not make a fortune on this "great" invention, because of its low efficiency in high power band, and pickiness on material properties. Anyway he did make history of challenging traditional blade rotary turbine. Even nowadays, all over the world, there are lots of turbine designers still appreciate Tesla turbine, and further perfect it with new idea. As a turbomachinery experpert, your invention is deeply interesting me, and I spent long time to study your reciprocal turbine, after saw it here. Now I have a conclusion: this revolutionary innovation works for sure, and efficiency can be very close to the highest theory limit, both in low power and high power band! You will probably make history again in turbine industry, and there will be a reserved space for it in future museum of turbine. Pre-congratulations to your achievement! To my best knowledge, there is yet space of improvement based on this invention, some minor modifications may significantly simplify the complexity and reduce manufacture and maintenance cost. Just wish you can figure out most varieties of potential improvements, protect the derivative intelligence properties as well. It seems this proposal is a neglected rare gem of this year contest. It deserves a Wikipedia entry, anyone can add this exotic "turbine" to Wikipedia? Appreciate anyone's effort! Wind turbine is cheap, so developers use as elements to express art more than technology, I doubt. Reservoir-backed hydro stations are not affordable to play above art. If this cheap "shutter turbine" works fine, someday, maybe same dense array will be deployed along wriggling rivers everywhere. Wow, still so many followers concerning this invention! but sorry, I have no time to reply all your guys, because of very busy on other innovations. Osmosis battery & high magnetic field generator & superconducting ionic current loop. Better than Pressurized Retarded Osmosis (PRO) technology! Recharging this battery can be done by Reverse Osmosis (RO). If luckily live beside ocean, perhaps no need RO recharge, simply drain & dump the exhausted salt solutions. Basic model no terminals for voltage output, because if lepton (electrons) flow and baryon (ions) flow share a current loop, there must be chemical reactions between the interfaces, but osmosis is not chemical phenomenon. Fortunately not only our improved version can output torque, but also electricity by non-electrochemical means. This idea is good idea, but your guys can not spree on scavenging energy from rivers, just like as planting dense turbines in above shown wind farm, you have to secure SOCIAL LICENSE before soaking a shutter turbine, because water resources are public community asset. 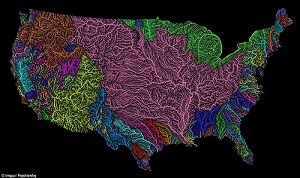 Only by such licensing system, the public water resources can be reasonably used in a grand whole plan. Without social license, I bet you guys may suffer huge loss, even bankrupt. "Nepal scraps $2.5 billion hydropower plant deal with Chinese company"
It is rumored that Nepal people saw this proposal and feel your cheap damless distributed hydropower better than the expensive $2.5 billion great dam project designed by China hydropower builder. Funny, if it is true, then you ruined Chinese government big deal! As a bystander, to my best knowledge, the above-mentioned screw microhydro system is too micro, maybe the inventor dont understand how important is the area of cross section facing water flow. According to this proposal, the power density of 1 m/s river is 500 watts per square meter, then the power of the pictured turbine may be less than 300W. The capital cost seems too high to cope such small deal. 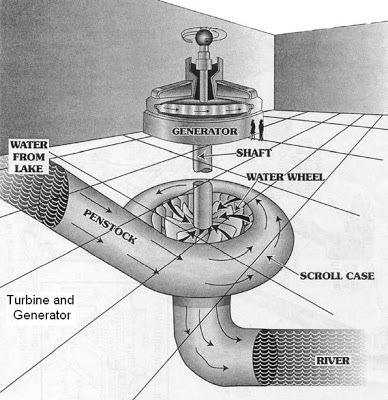 I appreciate the cheap shutter turbine, as it can make most use of river cross section regardless shape, so it can harvest energy in scale of not only microhydro, but also top capacity hydropower. As a business rule, sorry, I have to evade invitation of commentation on any my current competitor. I have a better name for your invention: board pressure retarded hydropower system. Shutter turbine is a bad name, because turbine always suggests something spin, but here nothing spin. Anyway, your invention gets rid of dam construction, so community may love it. Thanks for all your guys ongoing focus on this technology. As no fund support it, I have shifted to osmosis energy storage & restoration technology. Good news: My recent research have achieved breakthrough inventions. For details, just follow me at twitter http:\\twitter.com\kiwaho. As a farmer scientist, I love to serve farmers first. Go to the moon and make the deserts bloom! Wow, the first dream has been realized, but the second still not yet. I believe my inventions can make the second dream come true soon. Follow me in twitter, if you like more interactions. In the 1st day of this month, DOE announced a new $30M funding opportunity to support long duration energy storage project. 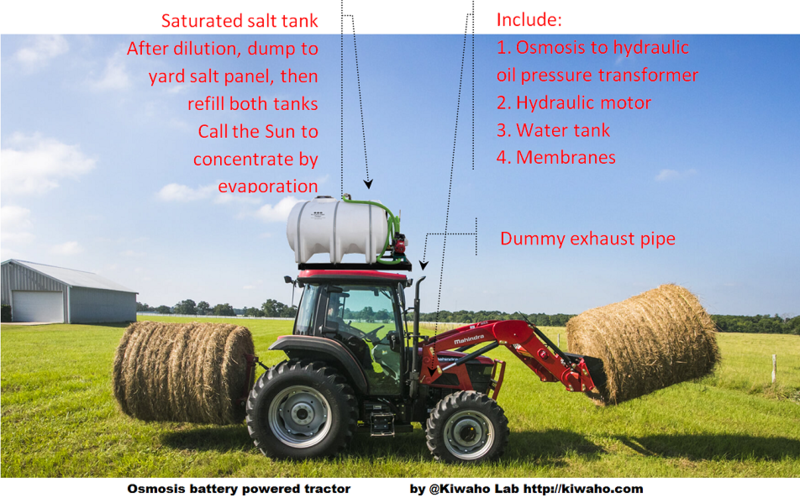 osmotic-hydraulic energy storage & recovery system with large landscape solar evaporation pond of saturated salt water. As per the criteria of eligibility, unfortunately it is not possible for me to be an eligible independent applicant, because my laboratory entity is incorporated in Canada. To circumvent this issue, I wish team up with US domestic resident or entity for compliance, then to eligibly apply the ARPA-E funding as a project leader. Therefore, I am seeking a partner, and considering to establish a consortium for facilitation of supply chain, standardization and marketing. The DOE sets NOI (Notice Of Intent) deadline June 15, and it is coming soon. So, if anyone interested, please let me know quickly. The patent full text is available on request of potential partners. Osmotic powered ship! the fuel is just saturated salt water & seawater. The diluted exhaust solution is re-concentrated by solar evaporation of the shallow pond on ferry vacant land. In fact, it is 100% clean indirect solar energy! For the Dead Sea voyage, the in-ship container in above figure shall be filled up with seawater. Seawater can be channelled from the nearby Mediterranean shore to the Dead Sea shore. Needless any recharge energy, because the Sun always works hard on evaporating the Dead Sea. 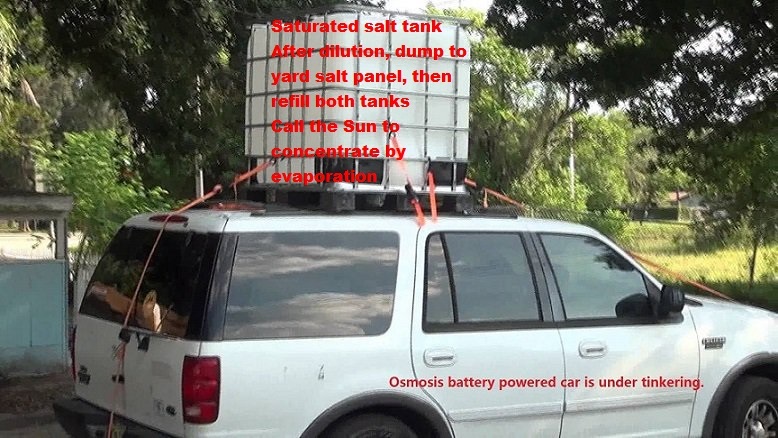 If voyage in sea or river, just fill up the in-ship container with saturated salt water, but unfortunately, a large size solar evaporation pond is needed for exhaust solution dump and refill saturated salt water. If no vacant land on the ferry terminal, a float near shore solar evaporation pond can be used for exhaust solution dump & recharging ferry. 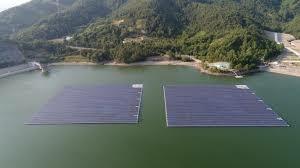 Attention: it is not float PV panel on sea, but float pond with saturated salt water which salinity = 10 x seawater. Good news: my improved PRO patent is published yesterday by USPTO. It is a new kind of heat engine, different with Stirling, Rankine and all internal combustion engines. No gaseous phase during heat engine runs, only solid and liquid phase cycling, and No turbine, only standard hydraulic motor. Its working media is Phase Change Materials(PCM), and the heat source or sinker can also be PCM. Everyone knows that an uninsulated plumbing pipe will rupture in winter, but less guys know that even a 1" thick iron pipe can not survive the icing pressure: ~3000 atmosphere! In contrast most steam turbines just runs 10 to 100 atm. Therefore the retarded phase change cycle can transmit huge power! Because Trump's face change is powerful too, so I call this new type as Wei-Trump engine. One of its most interested application is for zero-emission cars to replace expensive lithium battery with a lithium-based storage-purposed PCM (427 °C melting point) thermo exchangeable cartridge. The heat engine efficiency can be ~40%, better than diesel engine. 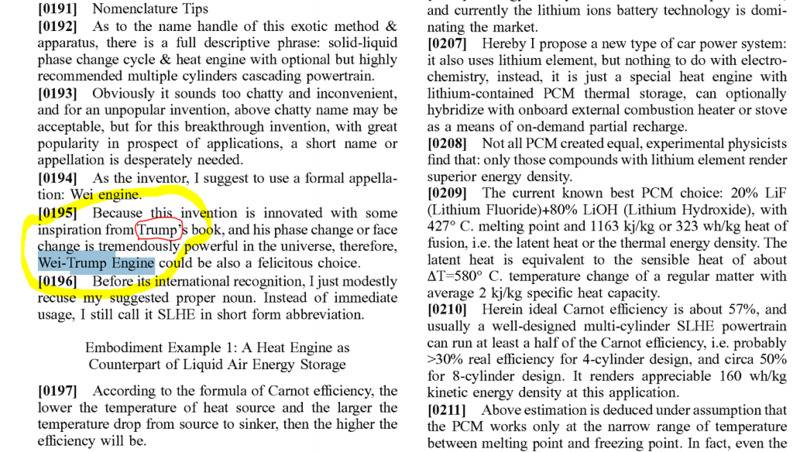 The heat of fusion of the Li-thermo is 1163 kj/kg or 323 wh/kg by thermal or 160 wh/kg by mechanic. It is the highest amid all compounds around the temperature. Obviously its energy density is similar to Musk's Tesla battery. If we don't want equivalent mileage range per recharge to Tesla, just compromise the energy density with far cheap storage-purposed PCM, e.g. KNO3, etc. good enough for those commuters with normal short mileage range 50km per recharge. Easy integration with braking energy reclamation system, because they use same hydraulic accumulator. This invention can also be used in Net-Zero Energy Building (NZEB) system, working together with heat pump or solar collector or any-fuel burner. It can also work with air liquefaction equipment, in the promising domain LAES (Liquid Air Energy Storage), as long as the 427 °C thermo is replaced by -200 °C dewar. Because the powertrain only transmit hydraulic oil power, so it can hookup aux 12v DC alternator to hydraulic motor, for lamps, electromagnetic valves, circulation pump, radiator fan, computer, etc. As no more starter motor, therefore, tiny lithium battery or small lead-acid battery is enough. Attention: this invention has nothing to do with my previous invention -- osmotic power generation. Rake forest to fight California wildfires? No such thing, but my solar-wind-osmotic powerplant invention does work! With longtime such application, my cleantech can gradually convert US west desert into oasis by retaining clouds in sky for rainfall, so as to rehabilitate ecology, as well as to generate utilizable power. My commercial-secret: switching-mode hydraulic step up/down (aka boost/buck) can isolately adapt wide osmotic pressure change, just like a switching-mode DC power supply can stabilize voltage by adapting 70 to 250 VAC. It means that even the low pressure 50 psi tap-water flow can be converted to 5000 psi oil pressure with this commercial secret blackbox. Next time, when you use a 5VDC USB adapter or 120VAC inverter in your car with 12VDC socket, please remind of my breakthrough magic switching-mode hydraulic pressure transformer. For sale: both the patent-pending osmotic energy harvestor, and the commercial secret of switching mode fluid-fluid isolated hydraulic boost/buck DC-DC fluid power supply. Plus 3 years full time labor & tech support to implement your pilot project. As to the said commercial secret, I can also help you secure patent application. Some guys ask me how my invention is inspired by Trump's book: "Art of The Deal". Well, the answer can be found from my earlier article: "The art of trade-off invention - osmotic to hydraulic oil pressure transformer". Celebrities may not be the right expert on physics, they become famous by excellence only on their own specialties. What choked the Bill Gates backed startup company Lightsail Energy?